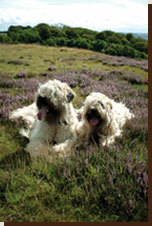 Welcome to the home of “Rollesby”, Breeders of quality purebred Soft Coated Wheaten Terriers. Max came into our lives in 1999 and things were never to be the same again. Sophie soon joined Max, then Izzy, Mac, Tillee, Fynn, Poppee, Skyie, Shannon & Maggie....for now...!!! Our breeding program boasts lines from the acclaimed Stevelyn & Kariskiye Kennels in the UK. Fynn is our new English import and is sired by the Top winning wheaten " Fantasy Blonde Kaos" in the Uk in 2009, 2010, 2011 so you can be assured that our dogs come from a well established line of quality wheatens. Our dogs come from a family home; they live on 20 acres with a multitude of other farm pets/animals plus their 4 siblings of the furry kind.... 4 cats and 2 small humans. They own half of the house and would not dream of spending a minute more than they have to outside if not with us. They are super loyal, trustworthy with all small creatures i.e. baby kune kune piglets, chicks, chickens and rabbits etc and they get on with all their larger friends like the Clydesdales. They are super adaptable and can live wherever you are, whether it be a tent, holiday home or just hanging at home. One of their main criteria is that they are with you!! Our wheaten pups from the first day they are born are thrust into our family life. They are used to the other animals and all household sounds, are socialised with our other dogs, children & adults, so by the time they reach you not alot phases them.